SICAM PAS can be easily included in existing systems and used for system integration, too. With modern diagnostics, it optimally supports commissioning and maintenance. SICAM PAS is clearly structured and reliable, thanks to its open, fully documented and tested system. Check out our reference map | See clients that we’ve installed SICAM PAS for. 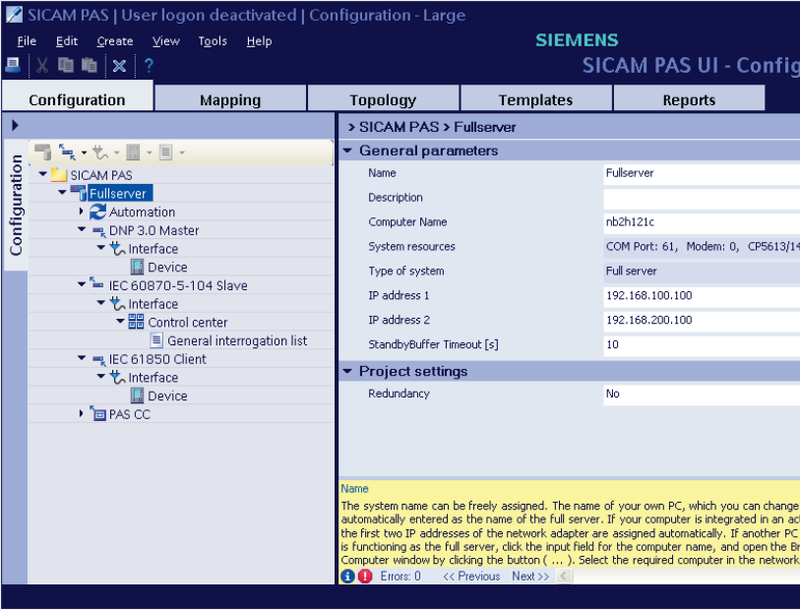 SICAM PAS works on industrial-standard hardware with the Microsoft Windows operating systems. The advantages of this platform are low hardware and software costs, ease of operation, scalability, flexibility and constantly available support. In a substation various types of protection units, IEDs, bay control units, measured-value recorders and telecontrol units from a wide range of manufacturers may be used. The system offers a large number of communication protocols to record data from these devices. SICAM PAS is developed in accordance with selected security standards and meets modern demands placed on safe communication. Asymmetric encryption enables tap-proof communication connection to higher-level control centers with IEC 60870-5-104 and DNP V3.00 via TCP/IP.